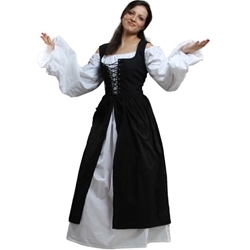 Made from 100% cotton fabric, this Ladies Peasant Dress in Black includes a bodice with attached skirt. The bodice is laced to fit with brass grommets, and the full skirt is split down the front to show a modest peek of underdress. Chemise sold separately.